Dactylorhiza x venusta, a hybrid between the Common Spotted-orchid Dactylorhiza fuchsii and the Northern Marsh-orchid Dactylorhiza purpurella. To find a recognisable orchid hybrid in the wild is exciting, but they are sometimes difficult to identify accurately because, even in relatively small groups of a single species, there can be considerable variation in the appearance of the flowers relating to shape, size, and most confusing of all, lip pattern and form. This robust and brightly coloured hybrid orchid can be found in many of the coastal habitats where Northern Marsh-orchid and Common Spotted-orchid occur. In Wales two good nature reserves to visit to see this lovely flower are Cors Dyfi (Ynyslas dunes system near Borth) and Newborough Warren in Anglesey. 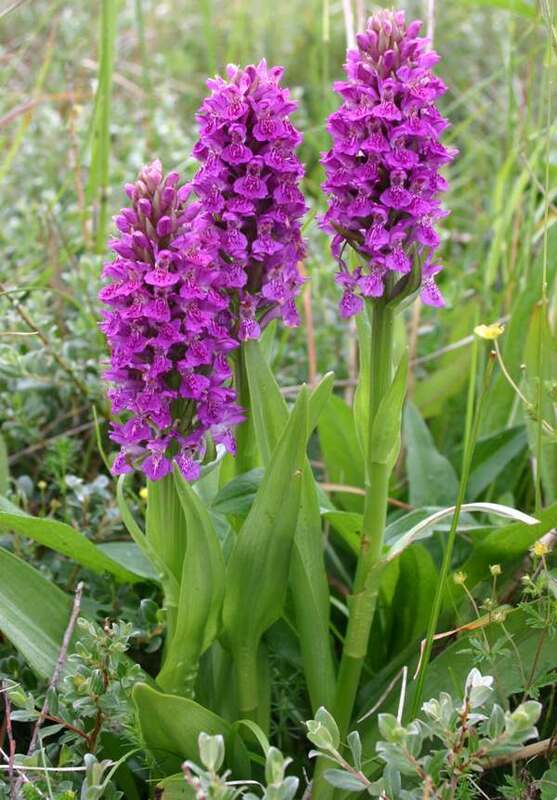 It is also found inland where ground is sufficiently marshy to support Dactylorhiza purpurella. Above: 1 - Common Spotted-orchid. 2 - Hybrid between Common Spotted-orchid and Northern Marsh-orchid. 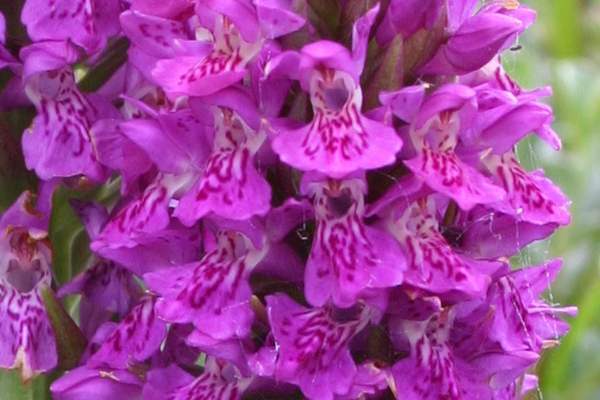 3 - Northern Marsh-orchid. This hybrid is unusual in that the flowers do not strongly resemble either parent and this makes the accurate identification rather difficult.